Business performance is about change through time. Driving a car is about changes in time. Driving a car to a desired destination is almost entirely about looking forward along a chosen route. Driving business performance is largely about understanding the context of current performance, and that requires historic information (looking in the rear-view mirror). Driving a car to a desired destination requires only driving skill and a GPS. Driving business performance is complex and multidimensional, with the best route to the desired state usually unknown. Driving a car is mostly about maintaining legal speed, healthy engine revs, and sufficient fuel, and keeping the car between the white lines. Driving business performance is inextricably about understanding and reducing variation to improve performance, where the parameters are rarely a given. Driving a car is mostly affected by our own direct inputs, in the moment. Driving business performance is affected by complex system dynamics that unfold over time (like the myriad policies, processes, and projects that enable or constrain what people can or cannot do to influence performance). The dials mimic tachometers and speedometers in a car dashboard, and sliders mimic fuel gauges. These help us choose the right gears, apply the right pressure on the accelerator, and avoid running out of fuel, when we’re driving a car. But they only show us a tiny snapshot in time of each KPI, when driving business performance. If dashboards were designed like this one, where the focus is on monitoring performance through time (not in time), it would encourage us to fundamentally improve performance. It would be great if we took business performance seriously enough to let the driving metaphor go, once and for all. 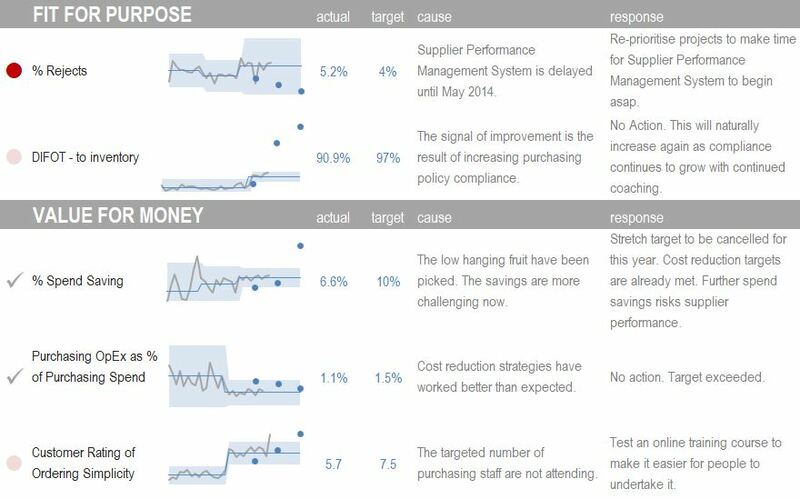 Why do we persist in playing with business dashboards like they are toy cars?